These really are like little bites of heaven. I originally found this recipe on the Delicious magazine website and have been obsessed ever since. 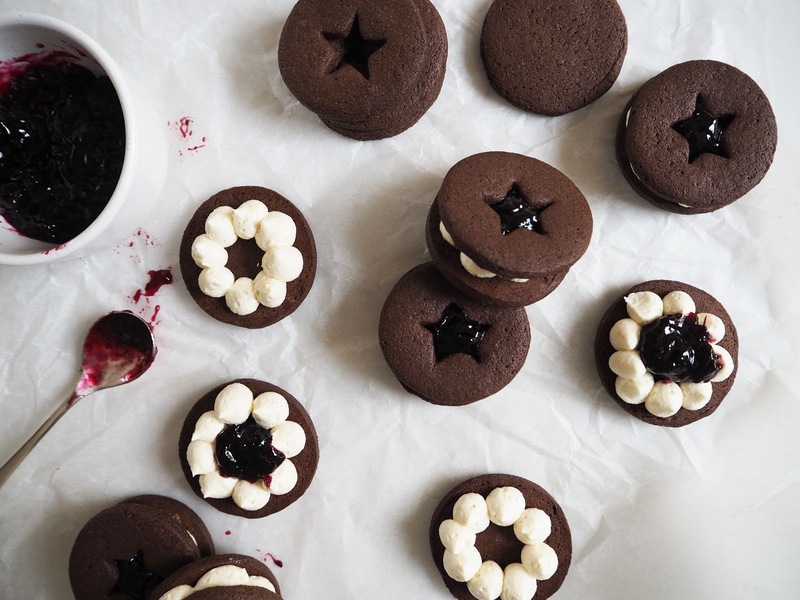 The chocolate biscuit, blackcurrant jam and peppermint cream come together to create an incredibly moreish sandwich biscuit. I guarantee you won't be able to have just one! The flavours work so well together and have been such a hit I am in the process of creating a three tier celebration cake version, keep an eye on Instagram for the finished design. Preheat the oven to 200C/180C fan and line two baking trays with baking parchment. Put the butter, brown sugar and caster sugar into a bowl and beat until combined and paler in colour. Add the vanilla and egg and mix on a low speed until combined. Keeping the mixer on a low speed gradually add the flour and cocoa powder until the mixture starts to clump together and form a dough. Bring together to form a ball, wrap in cling film and place in the fridge for 45 minutes. Once chilled, roll the dough out between two sheets of baking parchment until roughly 5mm thick. Using a small round cutter (4cm used here) cut out 16 circles, re-rolling as necessary. 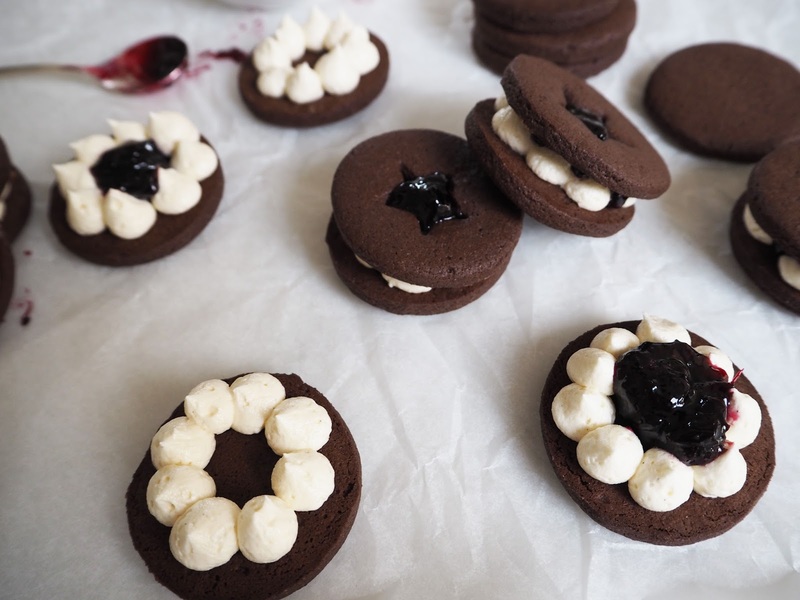 Using a small star cutter, cut out the centre of half of the biscuits to make the sandwich tops. Place the biscuits on the baking trays and bake for 12-14 minutes. Leave to cool for a few minutes before transferring to a wire rack to cool completely. To make the filling: beat the butter until pale, add the icing sugar and beat until combined. Add the milk and peppermint and beat on a high speed for a few minutes until the buttercream is light and fluffy. Spoon into a piping bag with a small round nozzle. Pipe small blobs around the outside of the biscuit. 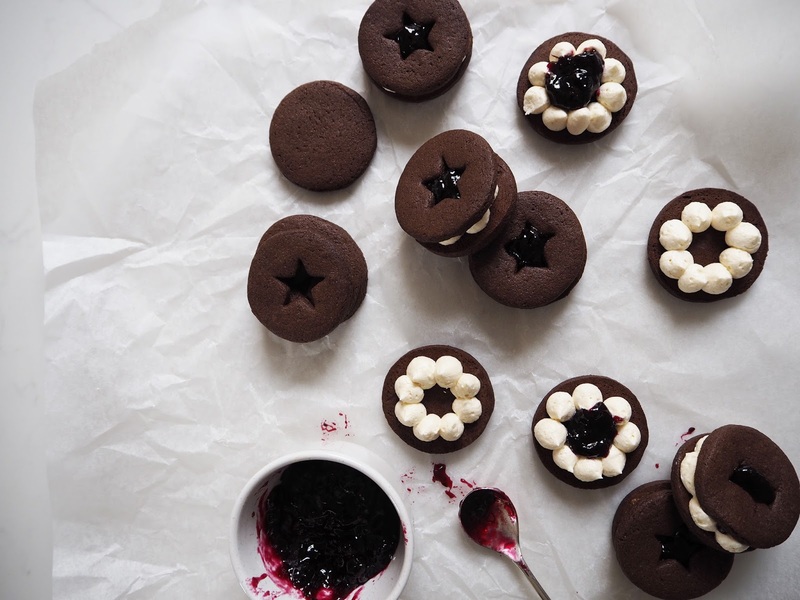 Spoon 1tsp of blackcurrant jam into the centre, then add the tops. Yummy!! You've an amazing blog, would you like to follow each other?